I intensely love London every time I make a new discovery like this. They say about this restaurant that it’s no ‘Pop-Up’ but a ‘Dining Experience’, which it truly is. From 09 May to 30 June 2012, you will be able to join the ‘ITALIANS DO IT BETTER’ dinners. 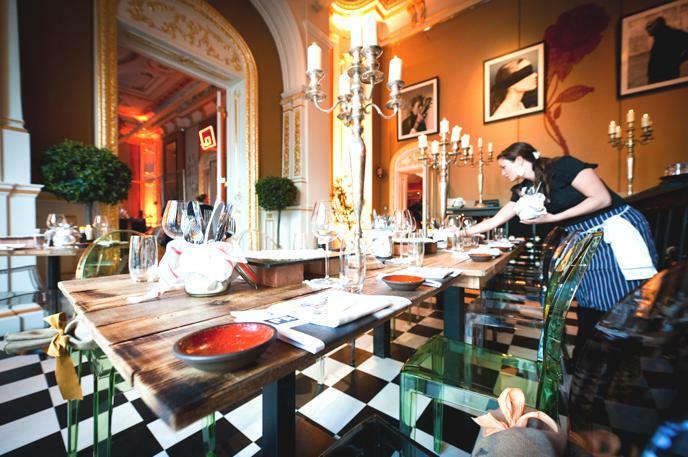 They are organised by Michelin-star chef Giorgio Locatelli who creates the traditional-style Italian menus. Every two weeks another Michelin star chef will join him (Accursio Craparo, Cristian and Manuel Costardi, Norbert Niederkofler and Viviana Varese). The menu consists of a choice between two 3-course menus (Locatelli menu and the guest chef menu). You will be very warmly welcomed by the incredibly dedicated and funky staff who will tell you enthusiastically about the concept of it all. The venue on St. James’s street in Mayfair looks absolutely incredible. Just really gorgeously done with swanky contemporary art and photographs on the walls. The venue is really spacious with various rooms to sit in and an open plan kitchen. This is for now my favourite restaurant in London! Go quick before they are gone! !